Naming rules: No more than 21 characters, no punctuation marks, numbers, or Roman numerals. No profanity in the name. 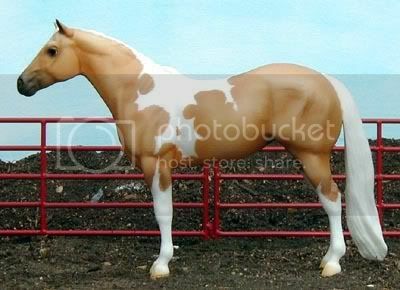 No two horses registered by the American Paint Horse Association may have the same name or similar sounding names. An (r) denotes a real horse used in the pedigree; (TB) denotes a Thoroughbred; (QH) denotes a Quarter Horse. 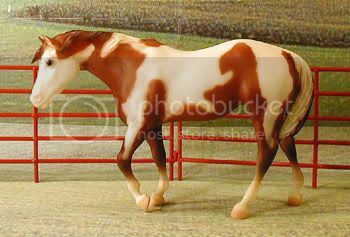 The horses on this page with a Thoroughbred parent(s) are also dual-registered with the Pinto Horse Association of America as Hunter-type. 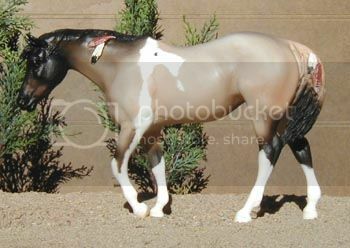 They would be good crosses for Hunter type Pintos, American Warmbloods and race- or pleasure-bred Paints. 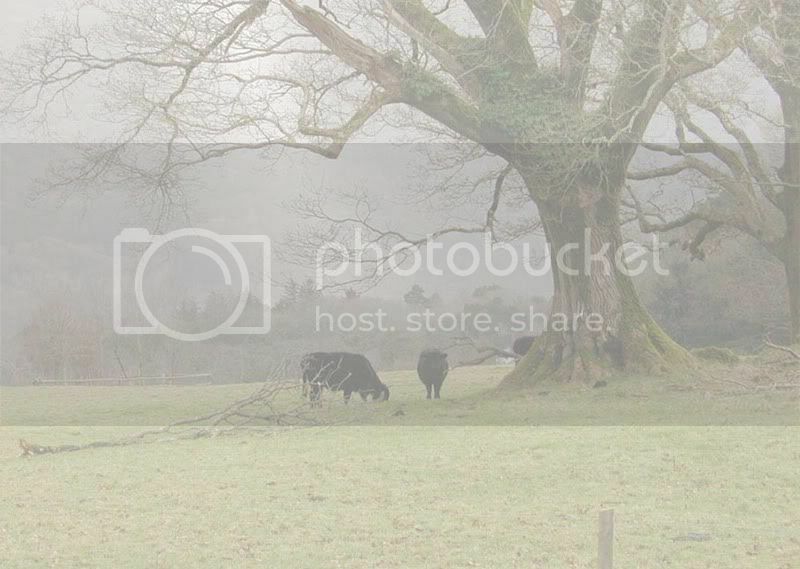 Click the photo for a pedigree and foal information(opens in new window). Model information: Breyer SM G2 Scrambling Foal mold, #5982 Stablemates Fun Foals Gift Pack, produced 2002-2006. Lines to Skipa Star Jr. Skipa Star[QH], Heidi Mount, A. P. Indy[TB], Seattle Slew[TB], The Signature[QH], Noholme[TB]. 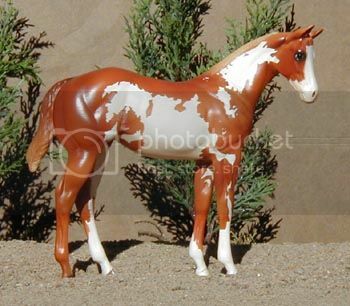 Model information: Breyer SM G1 Lying Foal mold, #59972 Pinto Mare and Foal, produced 1997-1999. Lines to Skipa Star Jr. Skipa Star[QH], Heidi Mount, A. P. Indy[TB], Seattle Slew[TB], Secretariat[TB], Nodouble[TB]. 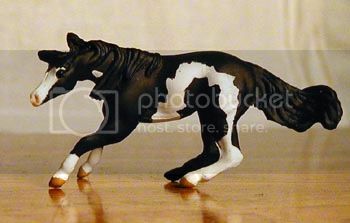 Model information: Breyer SM G2 Scrambling Foal mold, custom painted by unknown atist. Lines to Big Spruce[TB], Herbager[TB], Prince John[TB], Princequillo[TB], In Reality[TB], Intentionally[TB], Ride The Trails[TB], Robins Partee Time, Mr Robin Boy, Easy Jet[QH], Peppy San[QH]. Model information: Breyer SM G2 Thoroughbred; #10304 Hidalgo Stablemates Mustang Play Set, special run for Blockbuster stores in 2004. Lines to Hot Scotch Man, Man In Comand[QH], Jetalong[TB], Poco Bueno[QH], Hot Chocolate, Leo[QH], Tom Tom, Secretariat[TB], Bold Ruler[TB], Nasrullah[TB]. 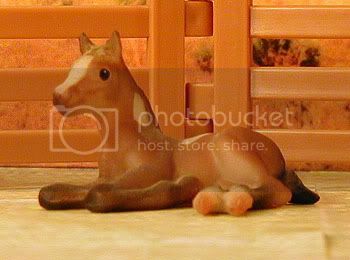 Model information: Breyer Stablemate scale G1 Standing Foal mold; produced 2000-2001. Lines to Grey Dawn[TB], Doc's Solano[QH], Doc Bar[QH]. 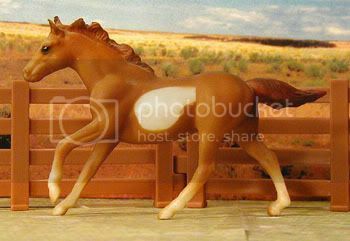 Model information: Breyer Stablemate G1 "Seabiscuit" mold; #5179 Running Paint, produced 1995-1997. Lines to Three Bars[TB], Cutter Bill[QH], Peppy San[QH], Uvalde Doll, Swaps[TB], Seabiscuit[TB], Seattle Slew[TB], Reviewer[TB]. 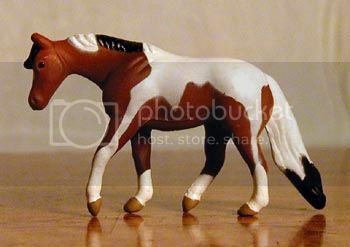 Model information: Breyer Stablemate G2 Thoroughbred; #5401 Flicka and Family Gift Set, produced 2006-current. Lines to Affirmed[TB], Foolish Pleasure[TB], Docs Stinger[QH], Doc Bar[QH]. 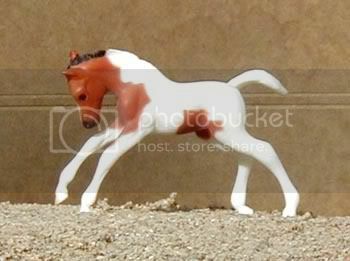 Model information: Breyer Mini Whinny scale Walking Foal(?) mold Foals set; produced 2005-current. Lines to Secretariat[TB], Bold Ruler[TB], Nasrullah[TB], Broadway Sonny, Sonny Dee Bar[QH], Injuns Delight. 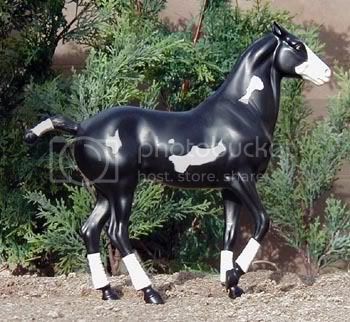 Model information: Hartland 9inch series Polo Pony mold. Special run of 50 pieces produced several years ago; "Black Tie Affair." Lines to A Tru Rolex, Tru Bruiser, Painted Tru Tru, King Leo Bar[QH], Leo Bar[QH], Leo[QH], Three Bars[TB], King[QH], Pacific Bailey[QH], Topsail Cody[QH], Wimpy[QH], Doc Bar[QH], Skipper W.[QH], King Wimp[QH]. Model information: Traditional scale Breyer Lady Phase mold; portrait of "Leah's Fancy Chic," 2000 Breyerfest Celebration model; 4,000 made. Lines to Sonny Dee Bar[QH], Sugar Bars[QH], Joe Reed[QH], Three Bars[TB], The Big Investment[QH], The Investor[QH], Zippo Pat Bars[QH], Skipper W[QH], Sky Top Bar. 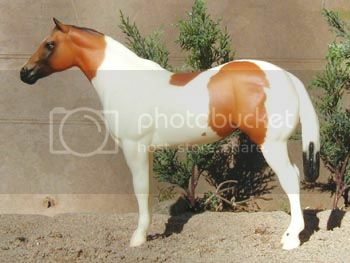 Model information: Traditional scale Breyer Indian Pony mold; "Sirocco," Breyer Breakfast Tour Horse; special run for Breyer Tour events in 1997. Lines to Impressive[QH], Three Bars[TB], Carbon C Miss[QH], King[QH], P S Tune, Music Maker, Hot Scotch Man, Yellow Mount. 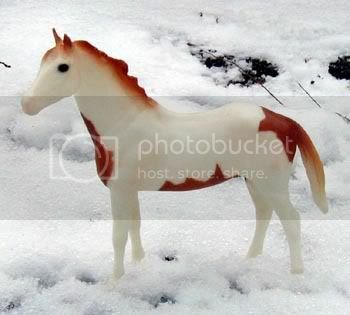 Model information: Breyer "Mini Whinny" scale Walking Stock Horse mold; from the Mini Whinny Mares set; produced 2005-2006. Lines to Zan Parr Bar[QH], Two Eyed Jack[QH], Three Bars[TB], Mr Tramp, Sugar Bars[QH], Scotch Bar Time[QH], Sonny Dee Bar[QH], Leo[QH], Joe Hancock[QH], Vandy[QH]. 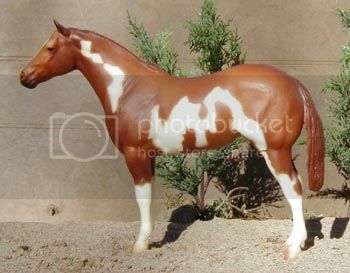 Model information: Breyer Indian Pony mold; portrait of Savanna Dial, 2004 limited edition. Lines to Ratchett, Rapid Bar[QH], Three Bars[TB], Wimpy P-1[QH], Doc's Sug[QH], Doc Bar[QH], Sugar Bars[QH], Leo[QH]. 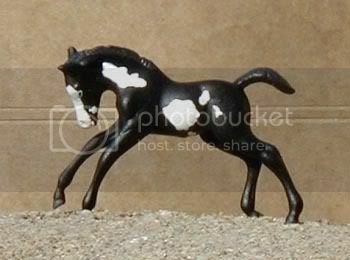 Model information: Breyer "Lady Phase" mold; regular run #771 Paint Mare, produced 1999-2001. Lines to Ratchett, Mardelle Dixon, Leo[QH], Hot Scotch Gold, Hot Scotch Man[QH], Socks Surprise, Son Ofa Doc[QH], Doc Bar[QH], Gay Bar King[QH], Tanquery Gin[QH], Doc O Lena[QH], King[QH]. Model information: Stone Horses Weanling mold; portrait of Parrs Dream Doll, First Edition 2002, 2,500 produced. Lines to Blue Max, Sonny Dee Bar[QH], Flying Fawago, Boston Mac[QH], Three Bars[TB], Joe Cody[QH]. 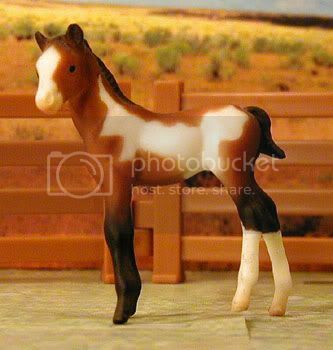 Model information: Breyer Mini Whinny scale Cutting Mare(?) mold Mares set; produced 2005-current. Lines to Joe Cody[QH], Doc Bar Linda[QH], Doc Bar[QH], Yellow Mount, Dotys Socks Jr[QH], Dotys Socks[QH]. Sire is an AQHA World Champion, NRHA Futurity Open Champion, NRHA Hall of Fame inductee, has a ROM in Reining, and is a leading sire. Model information: Breyer Traditional scale "Lady Phase" mold, custom etched by owner. Lines to Blue Valentine[QH], Red Man[QH], Joe Hancock[QH], Sky Bar, Skychief Bar, Three Bars[TB], Hank-A-Chief, Skips Lad. 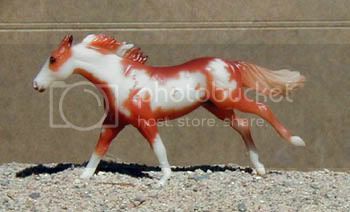 Model information: Breyer Indian Pony mold "N'iekeni"; special run for Mid-States Distributing in 2003, 3,000 produced. Model information: We recently aquired this lady in a group from Twin Springs. She is BSO for the time being, but will have a "body" assigned soon. Lines to Painted Tru Tru, Mr San Peppy[QH]. 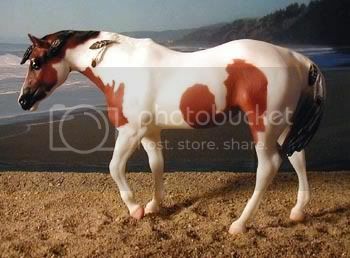 Model information: Breyer Traditional scale "Lady Phase" mold; 1248 Stock Horse Treasure Hunt, long tail version, produced 2006. Lines to Yellow Mount, Dotys Socks Jr[QH], Dotys Socks[QH]. 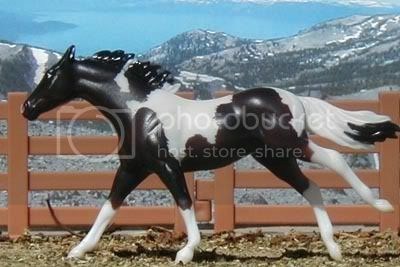 Model information: Breyer Mini Whinnies scale Reining Mare(?) mold; Australian Outback Playset, produced 2005-current.